Lopburi is an ancient city in Thailand about 2 hours (150 kilometers) north of Bangkok. It has a small population of fewer than 30,000 residents. The city was founded by King Kalavarnadish of then northwest India (modern-day Pakistan) in 648 CE. The city was ruled by the rising and powerful Angkor Empire (Khmer Empire) and quickly became one of the most important city centers in the region. Numerous gold coins dating to the seventh century have been discovered that are inscribed with the name of the city. Lopburi was visited by Marco Polo and is described in Travels, Book III. In the 14th century the Ayutthaya Kingdom rose to power and Lopburi served as an important stronghold for its rulers. It was the capital of the Ayutthaya Kingdom in the 17th century under King Narai the Great. The king made Lopburi his personal residence for around 8 months of the year. Much of the architecture that remains in Lopburi today was built by the Angkor Empire (modern-day Cambodia). 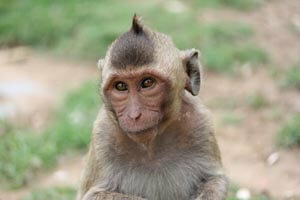 What makes Lopburi truly fascinating today is its population of crab-eating macaque monkeys. Embraced by the locals, the monkeys are fed and well cared for. A large population can be found at an ancient Buddhist temple in the center of the city. It is quite common to spot macaques roaming throughout the city and interacting normally with humans. The number of monkeys that live in the city is estimated to be around 3,000. Each year local villagers host the Lopburi Monkey Festival, also known as the Monkey Banquet. The date changes each year, but it is traditionally held on the last Sunday of November. Locals provide a large feast (an exclusively vegetarian menu) for the macaques, and the monkeys eat their fill. If you can't make it for the festival, the monkeys are there entertaining tourists and locals alike year-round. A word of caution, although the monkeys are relatively well-behaved, they are wild creatures. They will try very hard to steal anything you are carrying. Common theft items include cell phones, glasses, hats, necklaces, and cameras. Use caution and protect your valuables. If a monkey snatches something and runs away it's very unlikely you'll ever get it back. Additionally, monkeys can carry rabies. It's a good idea to get vaccinated against rabies before making the trip. If you get bit without a vaccination you should get the series of rabies shots immediately. During the Monkey Festival there are usually health care workers onsite offering rabies shots. Getting to Lopburi is very easy. There are daily trains and busses. A taxi from Bangkok can also be booked quite easily. In my opinion the train is the best option. You can take train number 7 which departs Bangkok's Hua Lamphong station at 8:30am and arrives in Lopburi at 10:28am. The fare is only 28 baht (less than $1). From the Lopburi train station it is a short walk (550 meters) to Prang Sam Yod (the Budhist temple) where the majority of monkeys congregate. Spend the morning, have lunch, then catch one of the numerous return trains back to Bangkok. Trains leave at 12:55pm, 13:45pm, 14:05pm, and at many more times into the evening. You can find the current Bangkok-Lopburi train schedules here. If you're an animal lover and planning a trip to Thailand, Lopburi is a great spot to schedule a day of interactive monkey watching. All photos by CT Thompson.